(19687.M184.51.2.14, Chester R. Cowen Collection, OHS). The Azalea Festival in Muskogee, Oklahoma, held annually since April 1968 to celebrate the beauty of the Azaleas blooming in Honor Heights Park, has become a national attraction, drawing record crowds. 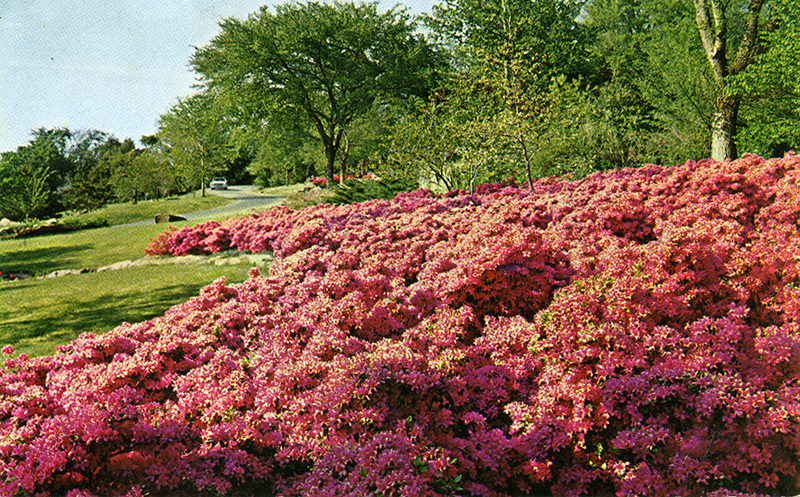 Art Johnson, landscape architect and director of Muskogee Parks and Recreation from 1949 to 1977, introduced azaleas to Honor Heights Park in the 1950s and is responsible for many of the azalea plants still in existence. Impressed by Johnson's informal landscape gardens and mass-color azalea beds, Maurice Dighton, a pharmacist, decided to bring recognition to Muskogee by making the public aware of the Honor Heights display of blooms. On December 29, 1967, Dighton, with the permission of the Muskogee Chamber of Commerce and a small donation of $175 from a local Kiwanis Club, began plans for the first Azalea Festival, held in April 1968. The Azalea Festival has always begun with a parade, often consisting of floats of various themes, antique cars, pageant queens, clowns, a procession of Shriners, marching bands, horseback riders, and cyclists. However, the festival's major focus is the free tours of Honor Heights Azalea Gardens, which contain more than thirty thousand shrubs in more than 625 varieties of both deciduous and Asian evergreen azaleas, producing a kaleidoscope of color throughout April. Since April 1968 the Azalea Festival has expanded to include approximately three weeks of activities such as an Azalea Ball, a chili cook-off, banner painting contests, antique car shows, quilt exhibits, arts and crafts displays, plant exhibits, and musical and dance entertainment. Each year something new is added, including a number of festival spin-off activities, all of which help promote the economy of Muskogee. Now a tradition, the Azalea Festival has become one of the most celebrated festivals in Oklahoma in April. Robyn Bradshaw, "Buses Rev for Azalea Tours," Muskogee (Oklahoma) Phoenix, 31 March 2002. Doug Hawthorne and Connie Edwards, Economic Impact Study of the Muskogee Azalea Festival (Oklahoma City, Okla.: Division of Planning and Development, Oklahoma Tourism and Recreation Department, 1991). Muskogee (Oklahoma) Phoenix, 2 April 1998 and 31 March 2002. Betty Ritch Lombardi, "Azalea Festival," The Encyclopedia of Oklahoma History and Culture, https://www.okhistory.org/publications/enc/entry.php?entry=AZ001.